Dakshin at ITC Kakatiya is arguably the best South Indian restaurant in Hyderabad. This is one of the places I look forward to the visit as the experience is always impeccable. Chef Sakala Sankara is a master of his craft and rolls out great promotions, one after another. 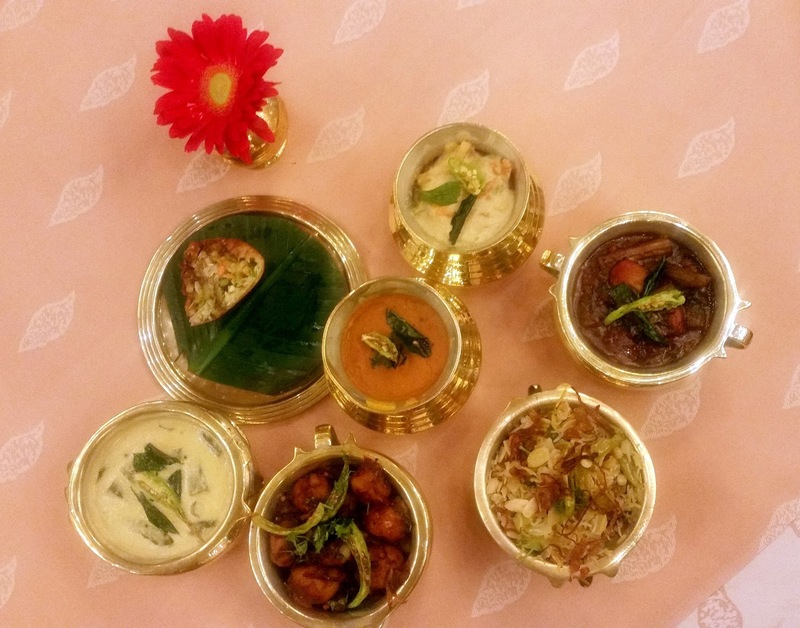 Recently, my friends in Kolkata were going gaga over the Telangana food fest he curated in ITC Sonar. However, when I was invited for the Mylapore Magic festival, I really did not know what to expect. As far as my knowledge went, Mylapore was a part of Chennai, so I wondered how it was special compared to the usual Tamil cuisine. I met the curator of the festival, Chef Rajan, a veteran in his late seventies, who is still hugely in demand even after nineteen years of retirement. 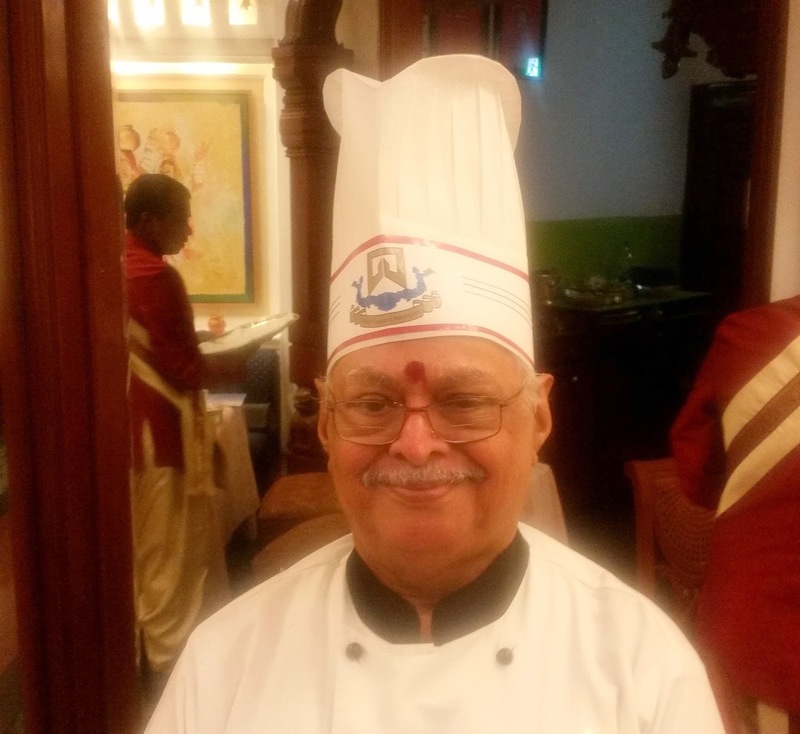 Still working at ITC Grand Central, Mumbai, Chef Rajan had been favourites of many celebrities like President Venkatraman, Narsimha Rao, MS Subbulaxmi and MS Dhoni, for the authentic South Indian food he dishes out there. For his talents and fame, Chef Rajan came across to be a person with a permanent smile on his face and a lot of humility. He sat with us throughout our food journey, and patiently explained each and every dish to us. 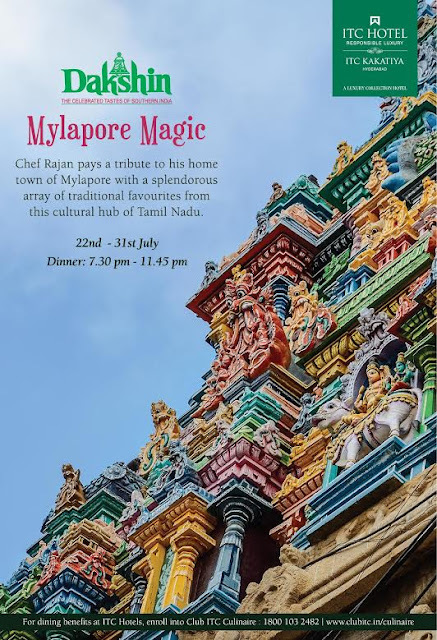 The promotion actually is a combination of two themes – Mylapore cuisine and a few non-vegetarian dishes specially prepared by Chef Rajan. As explained to us, Mylapore was earlier a traditional Brahmin locality in Madras, where the Brahmins had very simple food even without onion and garlic. We started with Thakali Rasam, a cumin flavoured tomato rasam, which had a very balanced taste. 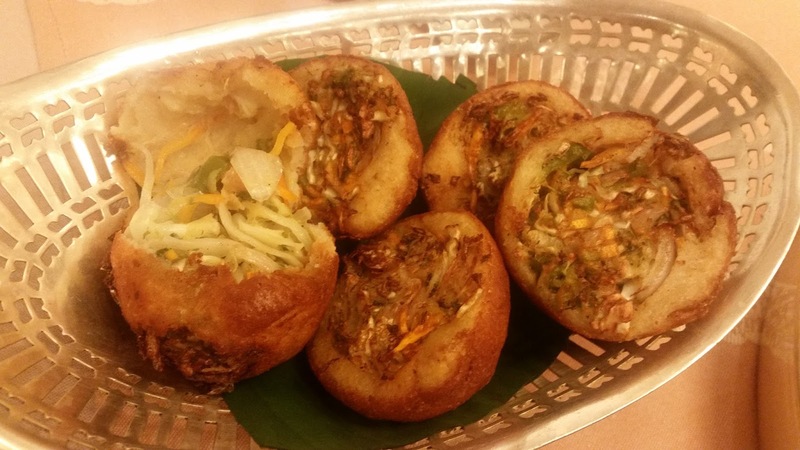 To accompany the rasam, Chef Rajan brought out Bread Bom, one of his signature dishes. These are specially created bread cutlets stuffed with an assortment of vegetables and cheese. This was easily one of the stars of the show, especially the filling. The drink which Chef Rajan had prepared for us was tender coconut water based Vasantha Neer, with a dash of lemon, honey and mint leaves. An assortment of chutneys was brought out with Tanjore Kunuku, a crunchy dumpling of rice flour, daal and grated coconut. Appams at Dakshin are always the best you can get. 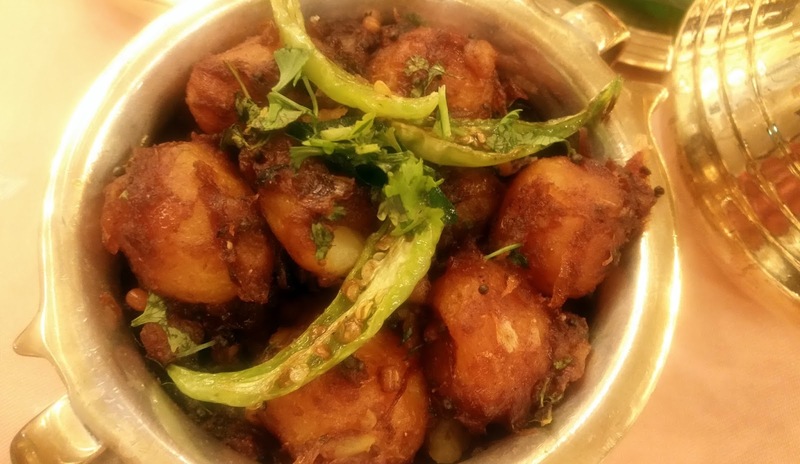 Today they were served with Murmgaikai Vatha Kuzhambu, a tamarind and jaggery based drumstick curry. This was a superb dish with a perfect combination of sweet and sour. I loved the slightly sweet Urlai Roast with the Veechu Parathas. The spice combo of the baby potato gravy demanded a second helping. 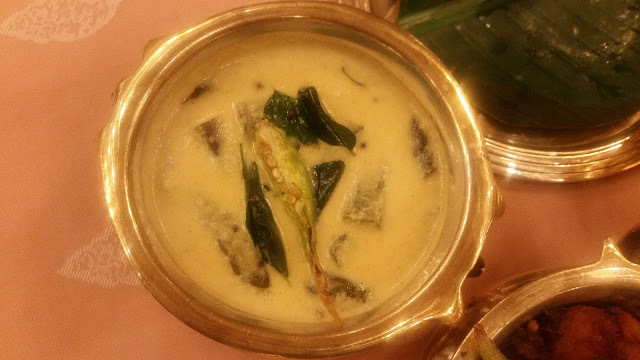 Dishes to be savoured with rice included the Thakali Paruppu (tomato based dal), Malabar Avial (with a strong flavour of coconut) and Bendakai Morkuzambu (here the bhindi is cooked in a yoghurt based gravy with coconut). Each of the dishes was typical soul food, light and tasty. This seems to be the hallmark of Mylapore cuisine. 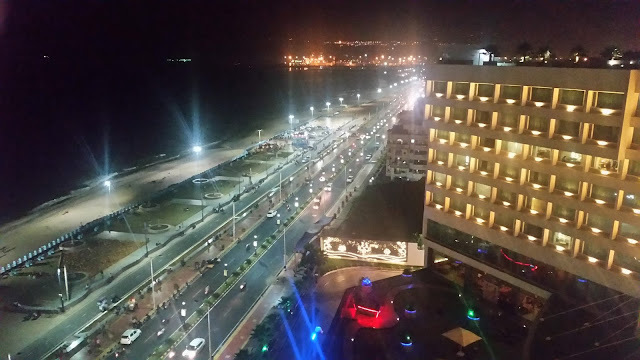 I loved the curation of the fest – no two dishes were remotely similar. 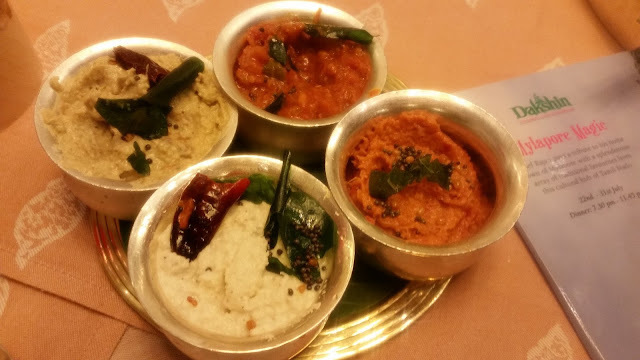 As we were told that Mylapore cuisine is traditionally vegetarian. Over the years Chef Rajan has adapted quite a few non-vegetarian dishes with his own ingredients and spices. The second part of the promotion is thus aptly called Chef Rajan’s Special. 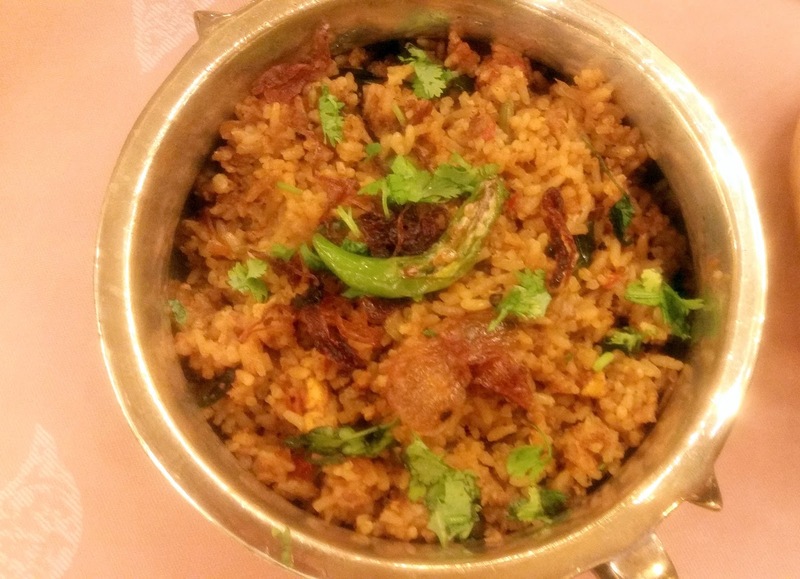 Chef is known for his Keemasadam, or keema rice, which has become a legendary dish in Mumbai. 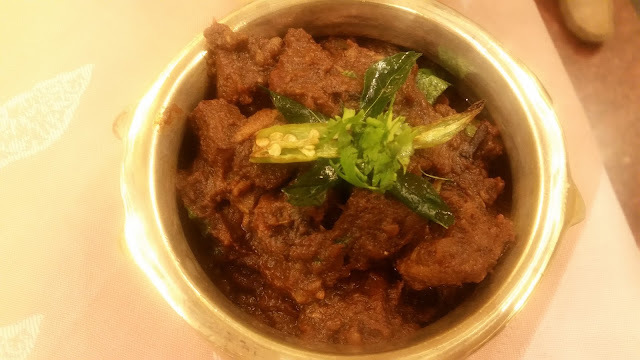 Again a very simple dish where the taste of mutton mince is combined with some aromatic spices. The other mutton dish was Veinchina Mamsam, the popular dish from Andhra Pradesh. 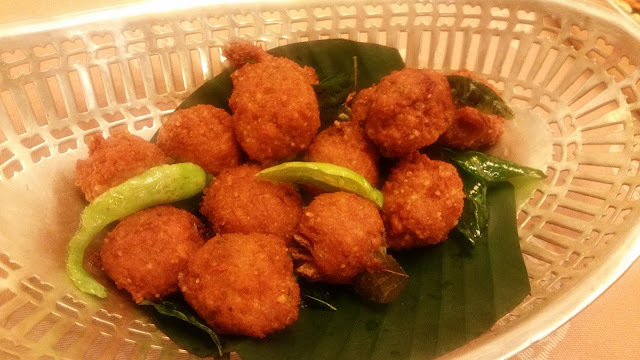 But Chef Rajan had added a special coconut based masala to it giving it a different spin. This was another star. 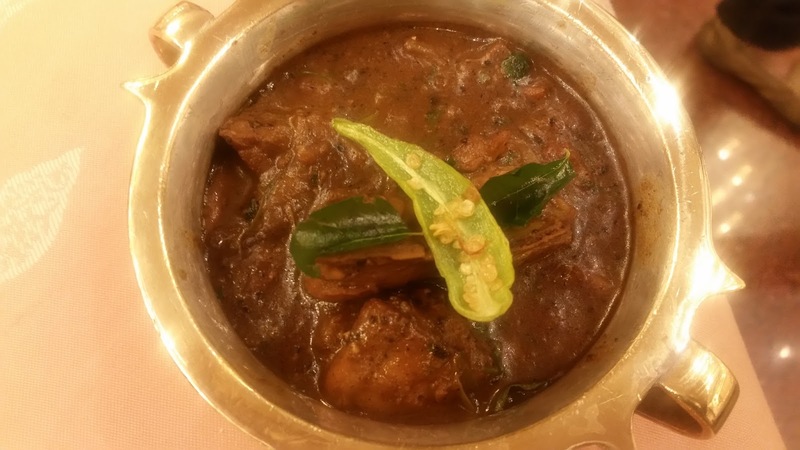 There was also Melugu Kodi Chettinad, a pepper and coconut-based chicken curry. I loved it with Bhadhaam Sadam, the almond rice. From Chef Rajan’s looks, I do not think he approved my choice of combining the two dishes. The almond rice had almonds, cashews and raisin in rice with no masala at all. It could be savoured as a standalone dish. I was too full by this time. Some special Chicken Dosa and Prawn Dosa came out, but I could try out only a small portion of each. 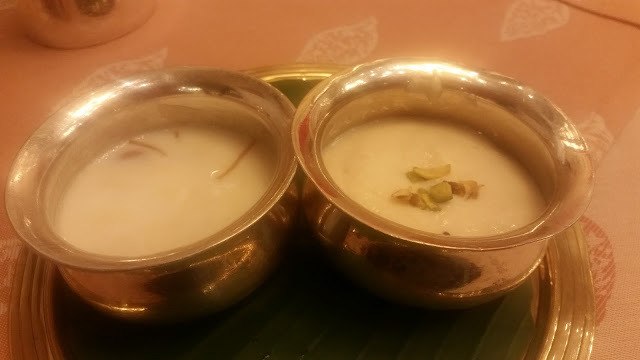 Of the two desserts served, Basundi was special. The Semiya Payasam was par for the course. I loved the festival because of the simplicity of food. Years of experience have gone into fine tuning the recipes, and this was the work of a master. It was my good fortune to interact with Chef Rajan. Clearly, he is a person who loves to share his knowledge with others. He told us that he is working on a recipe book for his dishes which will be published soon. Any connoisseur of South Indian food should not miss this promotion. All items are a-la-carte and pricing ranges from Rs 400 to Rs 1200. The festival is open only for dinner till 31st July. Very good writeup. I never thought that the there would ever be a food festival covering the underrated and unsung TamBrahm cuisine. 1) it's "Punuku" not "Kunuku". It's equivalent of the telugu "Punugulu"
2) it's "MuruNgaikai" (drumstick) not "MuruMgaikai"
Thanks for your clarifications. The names of the dishes have been taken exactly from the festival menu. We are no authority on Tamil dishes, so followed what Dakshin had stated in the menu. However Pappu was an error on our part and the same has been corrected. The recipe of Kunuku is available on the internet, so it is a valid dish.